Back in April 2015 I wrote a short blog listing my top ten favourite books of all time. 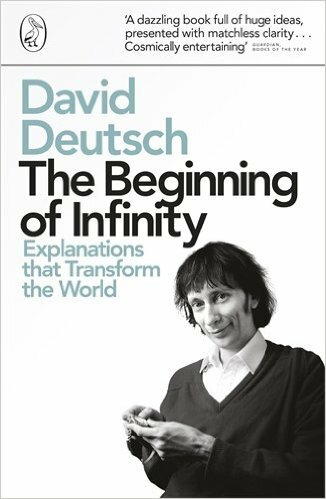 The list included the Oxford physicist David Deutsch’s The Beginning of Infinity. I think I might have been on to something because in his list of 23 books which he thinks we all should read, the founder of Facebook, Mark Zuckerberg also included The Beginning of Infinity! Published in 2011, I first came across The Beginning of Infinity the following year while browsing in a book store at St Pancras station in London. In the four years since then, I have reread the book each year. Parts of the book, especially the chapters about the Infinity Hotel and the Multiverse, I have found pretty hard going and difficult. Other chapters are simply brilliant and very persuasive – the chapters on Optimism and The Dream of Socrates are surely worth the price of the book (and indeed much more) all by themselves – and have quite simply changed the way I look at the world. Deutsch states that rapid progress that has continued over a number of generations has only occurred once in human history and that coincides with the start of the scientific revolution from approximately the beginning of the 17th century and it is still underway. He argues that whenever progress has been made, it has resulted from a single human activity which he calls the quest for good explanations. Humanity has known many bad types of explanation throughout its history. Thunder was once believed to be the result of the gods being angry. Later we learned of a better explanation involving atmospheric conditions, electrical discharges and sound waves. The changing seasons and the onset of winter were once thought by the Greeks to be due to the sadness of Demeter, the goddess of the earth and agriculture. Once again, we learned of a better explanation, thanks to science, involving the tilting axis of the earth. The search for good explanations is no mere intellectual exercise. Deutsch says it is fundamental to making progress. All evils, he asserts, are due to insufficient knowledge. To create knowledge, we need to seek good explanations. “Since the Enlightenment, technological progress has depended specifically on the creation of explanatory knowledge. People had dreamed for millennia of flying to the moon, but it was only with the advent of Newton’s theories about the behaviour of invisible entities such as forces and momentum that they began to understand what was needed in order to go there. Problems are inevitable. On one page in the book, Deutsch actually – and very memorably – carves this maxim out in stone for us so that we are left in no doubt as to its importance along with a second maxim which is also carved out in stone: Problems are soluble. Climate change, meteors, disease pandemics, cancer etc., – the list of problems we are facing and will face in the future is long indeed. However, if we are to overcome those problems then knowledge creation has to be made a top priority for all of us. He directs us to the motto of the Royal Society – established in 1660 – which is “Nullius in verba”: it means “take nobody’s word for it”. History has known a number of mini-enlightenments, including during the Islamic Golden Age, which Deutsch dates to between the 8th and 13th centuries. These mini-enlightenments, however, were all snuffed out, often by religious repression. The prerequisites for making progress include religious tolerance, having a tradition of criticism and dissent and being open to new ideas. In his chapter on The Evolution of Culture, Deutsch talks compellingly about the difference between Dynamic societies and Static societies and the promotion of rational and anti-rational memes. Static societies seek to disable the critical faculties of their members by discouraging innovation and new ideas and seeking to maintain the status quo through an emphasis on obedience and false piety and by discouraging criticism of authorities. It does not take a great amount of imagination to sadly see these forces at work across many Muslim cultures. This is bound to be a controversial observation – but is Deutsch correct in his analysis here? A number of Muslim societies have undoubtedly found it very difficult to adapt to the modern world and remain largely consumer societies, rather than productive and knowledge-creating members. One looks at the Satanic Verses Affair, the Danish cartoons, the Boko Haram sect, the nihilist movements of al-Qa’ida and ISIS and the recent murders of secular intellectuals in South Asia and can’t help but see a once great and proud civilisation in crisis. The West’s scientific revolution took wings once the power of the Christian religious institutions and particularly the Catholic Church was curtailed. Could it be that the Muslim world too needs to see a lessening of the influence of religious authorities if it is to emerge as a creative civilisation once again? This entry was posted in Books, Science & Evolution and tagged david deutsch, the beginning of infinity. Bookmark the permalink. Very distorted and selective reading of history and geo-politics…Firstly Catholic Church viewed Science as ungodly and fiercely opposed it… In the Islamic world it was never the case science and scientific enquiry was considered a means of serving the creation of God , secondly before Colonising there was no, seperation between religious education and secular education. In the institutions of learning after the preliminary education those with a passion for religious sciences would further their studies in that area, and those with a passion for worldly sciences would further their studies in that field. The likes of Omar Khayyam, Ibne Sina (avicenna), Al farabi, Ibn rushd, al Kindi , ibn Khuldun etc, etc. Were gradutes of this system. In fact Ibn Khaldun, Ibn Rushd (averroes) both taught their sciences in the same Al Qarawayn university in Fes with the likes of great religious scholars such as Qadi Iyad. So contrary to your assertion, it was the removal of religious authority by the colonialists from educational institutions which stunted Scientific progress in the muslim world. greatest obstacles to progress in the Muslim world. Perhaps those countries would be better served in preventing the ruling classes from being educated in the west, then we might see the emerging of a creative civilisation once again. Your above post speaks volumes about former followers of political Islam..! I think political Islamic Movements were nothing more then a plot of the west to create educated derelicts with colonised mindsets, we see them spend their youth blindly chanting slogans against the west, and once they get older they flip and then you see them chanting slogans for the west. They seem to have not to have a good a grounding in their own history or religion, whatever knowledge they have of Islam is taken from professors in Western Universities. This has created a large clique of emotionally unbalanced and unhinged indviduals…As for Rushdie affair, Boko Haram, Al Qaida,Isis you will find Western Governments and agencies have a hand in instigating and intiating each one of those issues…Perhaps its time for you to spend time learning from Islamic scholars and historians it might help you overcome this inferiority complex. I do agree that the Qur’an encourages Muslims to investigate the world around them. However, today’s reality is quite different. If there is no tension between science and the Muslim world, why do you think so many Muslims scholars still continue to reject Darwin’s theory of evolution which is the most fundamental unifying theory in Biology? Also, the Muslim world lost its lead in science many centuries prior to the era of colonisation. We can’t keep blaming all our ills on colonisation. Maybe you are asking the wrong questions? Perhaps the question you need to ask is why the Muslim Scholars with academic degrees in various sciences reject evolution? Secondly science is continuously evolving we find that most prominently in the field of Medicine, and human biology, new discoveries are being made continuously. Here is an article from the guardian, what if Darwins theory of Natural selection is wrong. For you to present evolution is an example itself is erroneous.. perhaps in a hundred years time we might get Scientists, once again rejecting Darwinisim and his theory, or maybe stating that his theory is only fractionally true. Thirdly: When there are two opposing schools of thought the one that is given greater sustenance, publicity and financial support, will receive greater traction. This will then become the dominant narrative, and will attract greater followers in the respective field. Professor Robert Caldini in his book Influence the Psychology of persuasion, called the Law Of Social Proof, applies here..! What we have seen in the field of medicine is that the most fundamental unifying facts ,not Theories facts being disproven with time…And just because something is a unifying factor does not make it correct, to give just one example presently the most commonly held belief in the Medicinal field is..that if you have type 2 diabetes it is irreversible, and that once Heart disease occurs it is irreversible..Dr David Ornish has proven both facts to be bunkum. Your above post if nothing else has inspired me to read Imam al Ghazalis, ‘Deliverance From Error’ only just begun reading it and it is quite fascinating.. For those who have not read it this was a period In Imam Ghazalis life when he was skeptic,so he decided to go back to the drawing, travel and study all the dominant sciences of the time from the experts in those sciences to arrive at the truth. Inayat if your contention is that the religious Scholars in todays world by and large have failed to engage in an indepth study of sciences like evolution, ..Then I think that is a valid argument but only for those Scholars living in the West, because a science like evolution is not in the discourse in most parts of the East so there is really no reason for Scholars to want to engage in a study of it. Although in the west we are seeing the emergence of a new generation of religious Scholars who are doing research and studies in these areas … Interestingly Imam Al Ghazali states the following in this regard. Anyways I would be interested to know your thoughts on “Deliverance From Error”? I can’t make any sense of your argument that “a science like evolution is not in the discourse in most parts of the East so there is really no reason for Scholars to want to engage in a study of it.” As I mentioned earlier, evolution is the fundamental overarching theory in Biology. The fact that so many Muslims have issues dealing with it (as many evangelical Christians do too) is more to do with following narrow-minded interpretations of religion and an unwillingness to examine and embrace new ideas – an attitude Deutsch rightly rebukes in his book. As for Imam Ghazali’s Munqidh Min ad-Dalaal (Deliverance from Error): I bought it over twenty years ago and enjoyed reading it at the time. As I don’t read Arabic, I bought the English translation (published as The Faith and Practice of al-Ghazali) by…guess who? Yes, W. Montgomery Watt – and I just looked and I had forgotten that he had signed my copy of that book too, in addition to signing my copies of Muhammad in Makka and Muhammad in Madina. Depends what you mean by “overarching theory in biology”…If you are talking that humans evolved from apes then frankly that is nonsense…I have no doubt in my mind that it will be proven to be so, in the future. As for what I stated it makes perfect sense, this “theory” that humans originated from apes is considered by people of all religious persuasions in the East and even those of no religious persuasion as nonsense. By describing the theory of evolution as “nonsense” and denying humanity’s common ancestors with the great apes, you merely underline the point I was making in my blog about the issues that much of the Muslim world is having accepting the modern world and science. That we share common ancestors with the great apes is a fact. Evolution is both fact and theory. It is a fact that all organisms are related and descended from common ancestors. The theory part refers to the mechanism by which the fact of evolution occurred ie by means of natural selection according to Darwin. It is not Fact, as far as I am concerned it is just a school of thought that has gained the most traction in the scientific world because the scientific lobby within that clique has become the most dominant voice in the world of science and any scientist who rejects and questions evolution is mocked and ridiculed and ostracised (They seem to me like Zionists of the scientific world)…well I just googled the words Deutsch and atheist, got directed to a website called, ‘Celeb Atheists’, did the same with Stephen Jay Gould: got directed to the same website..! Subha’Allah your taking your deen from a bunch of atheists…! seems rather similar to those centuries ago who became mesmerised by the eloquence of the Philosophers, or those who became hypnotised by the arguments of the Logicians. So we had different type of heretics in the past, The Mutazalites were a cult of rationalists who took from both these groups gained support of the royal court and tried to impose their ideoleogy on others. We had other similar cults, the Qadiriya, the Jabiriya etc..!On the opposite extreme we had the extreme Mystics and the ascetics these groups of heretics rejected all logic and rationalism completeley and argued truth could only be arrived at, through sensual and mystical experiences. As for your argument, “that much of the Muslim world is having accepting the modern world and science.” things like Zinah in its variant forms has been prevalent through out history, fact is Europeans were Christian in character and belief rejected as abhorrent and Immoral and rightly so..! just because the west has turned back on the deen and might Halal had was haram, so what you saying the muslims should do the same? Because the Modern world which I presume by this you mean the west says so? Just because certain creation have some similar genetics to humans does not mean that we have common ancestor, who was an ape. The fact is any Muslim wanting delve into these subjects needs to first study from Muslim experts the Classical books written by Ulemah on Aqeedah, Kalam (theological doctrines) , Mantiq ( Logic) Falsafa (Philosophy) and also basic Tafseer and science of hadith…. Because if the indvidual is not solidly grounded he will become overwhelmed by the eloquence of modern philosophers like Deutsch, and Dawkins and logical progression for him will be Atheism. We Muslims accept both the aspects of the Modern world and Science that conform with the truth and what was taught to us by Allah and his Messenger (Sallalahu alayhi wasalam) anything other then that is falsehood , we make no apologies for this. Regardless how much the west and its Scientists dislike it. Just something is promoted as an over arching belief in the scientific world today does not mean it will be the over aching belief in a hundred years time after all what were the over arching beliefs in Science a hundred years ago? Fact is Science is constantly in a state of flux, sometimes rejecting theories they deemed as fact in the past, other times accepting theories they rejected in the past and along the way coming up with new theories….So perhaps the problem is not with the Muslim world perhaps the problem is with you? have you thought about that? Go and studies the Classical Islamic works in the company of Muslim Scholars, to help correct your imbalance…! So, in short, you agree that you have a problem accepting the scientific consensus on evolution because of your interpretation of Islam. That was precisely the point I made in my blog about one of the most serious problems in much of the Muslim world… The failure to come to terms with science and the modern world. No..! My contention is that there is no serious problem with the Muslims rather there is a serious problem with you and other modernists who would like Islam to be subservient to the west and have a problem accepting the theological consensus of learned Scholars of Deen over centuries on the fundamental articles of Faith and origins of creation as layed down in the Quran and Sunnah. As I said, your interpretation of Islam prevents you from accepting evolution. That is precisely the point made by Deutsch of how static societies promote anti-rational memes that disable the critical facilities of their members. Your responses on this thread are a great example of static thinking and anti-rational memes in action. My point is exactly the opposite, you seemed to have been mesmerised by these cult of atheists and lost your critical faculties to evaluate what you are being told in light of the Quran and Sunnah. For me your responses on this thread are a great example of an inferiority complex. Everything must be critically analysed except the meanderings of pseudo-philosophers from the west who have packaged their views in a scientific context. Needless to say my religious understanding is fully in alignment with the mainstream Scholars of this Deen who have acquired their Scholarship from other Scholars and so and so forth.Your interpretation of Islam seems to be rather personalised and fully at odds with the mainstream muslim community and orthodox Islam. I find that quite fascinating, I would be far more interested to know what your top ten books on Islam are? If evolution is to be rejected as nonsense, what do you see as the sensible alternative? Sorry to say I’m not your old chum – are you missing him? Your response to Inayat at 12.01am this morning seems to answer my question. Perhaps it is better to view creation as laid down in the Quran and Sunnah as metaphorical. It is sad to say it, but you might consider changing the name of your blog to Inayat’s and Ash’s Corner. I do find Ash’s overly verbose comments a bit tedious, but they do inadvertently serve to highlight many of my points about the state of much of the Muslim world today. Also, readers can judge for themselves whether he is someone who responds rationally or with a closed mind. ..That led me here!…What led me to stay here? Well I found a lot of the posts in the comments being made were by Islamaphobes , so somebody had to fight the other corner. I can understand why you would find my posts tedious..But questions is why you have never found the posts by my Dear old friend Libertyphile and his constant snide remarks against Islam and Muslims tedious? he was here years before I was. Well My Dear Old Chum.. on the contrary It is sad to say it old chap, but perhaps you should change your nick name to Censorshiphile….Let me get this straight if one googles “LibertyPhile” we find literally hundreds of posts by you going back years villifying Muslims, left right and center, on various forums. Even here on Inayats corner, you have been making various caustic and belligerent remarks ,for years , as soon as brother from the innercity stood up to you, you cant handle it.., Whats the matter you ran out of Islamaphobe websites to post on?.. .What happened to absolute freedom speech? and yes I get it what Islamaphobes mean by absolute freedom of speech, is “That we have the right to villify muslims but muslims should not defend themselves or they will be censored”…Shame on You.! If Inayat does not want me posting, all he has to do is ask, and I will stop posting… Although it will go against his principle of freedom of speech, and be a clear double standard, allowing a committed and professional Islamaphobes like yourself to post here unchallenged. Whilst excluding mainstream muslims from the discourse. Just read an interesting article by a chap called Hasan Radwan, it is about reclaiming religion from fundamentalists, and the following seems to concur with the points you make in your review. So this guy Hassan Radwan was a Muslim became an atheist, then realised there was not much money in being a non-muslim atheist , instead he should adopt the tactics of Maajid Nawaaz and pretend to be muslim…So he now he calls himself agnostic Muslim, and he is going reform Islam, to suit Imperial interests and agendas.